Preheat the oven to 180°C/350°F and line a baking sheet with parchment paper. Halve the figs. Wash the green onions and cut into thin rings. Wash mint and cilantro, shake them dry, and finely chop. Crumble feta and pluck out the pomegranate seeds. Transfer figs to baking sheet and drizzle with honey. Bake figs in the oven for approx. 10 min. until they are slightly browned and caramelized. Add couscous to a large bowl. Bring the vegetable stock to a boil and pour over the couscous. Leave covered for approx. 10 min. For the dressing, pour lemon juice, olive oil, ground coriander, honey, salt, and pepper into a sealable glass jar, close tightly, and shake. Fluff the couscous with a fork, add green onions, and mix with the dressing to taste. Add some couscous to a serving plate. 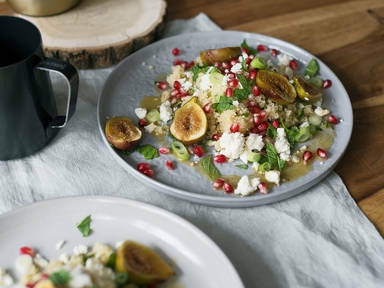 Top it with pomegranate seeds, crumbled feta, and honey-roasted figs. Garnish with cilantro, mint, and green onions. Enjoy!